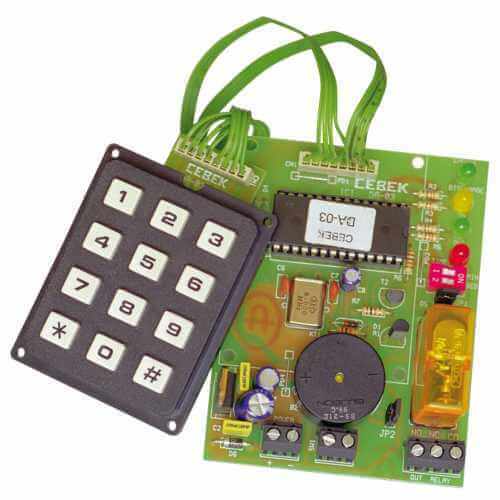 The Cebek D-03 module is an electronic lock controlled by a keypad. You can program up to 10 different 4 digit PIN codes. These are stored in non-volatile memory so are retain in the event of power loss. PIN codes can be enabled or disabled as the system administrator requires. The module is fitted with a buzzer that sounds when a PIN code is entered and LEDs that provide a visual indication of the PIN codes access status. There is a mains rated relay output with an adjustable ON time between 1 and 60 second or 1 and 60 minutes.